Gabriel grew up in the Kwantlen community and his father is also a drum-maker. He regularly gives talks around the Lower Mainland in schools and public spaces to educate about Indigenous history and culture. On Nov. 3, Gabriel spoke at an event at Deer Lake Gallery in Burnaby about Coast Salish drum-making and the culture around it. At the talk, a small group of guests took turns asking Gabriel questions about the history of drum-making, its contemporary role and the issue of cultural appropriation. 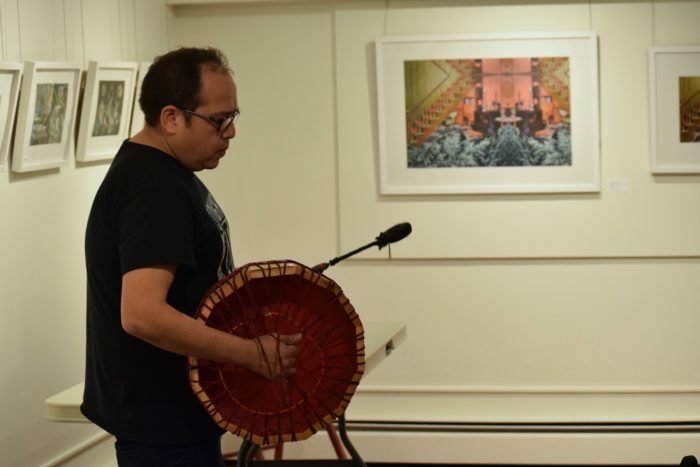 Gabriel hosts small drum-making workshops and spoke about how that has included non-Indigenous people, with his stipulation being that students must be willing to tell their own story in some way through the act of making a drum. “I actually want people who are doing that work to search and find some reason why they’re doing it,” he said. Gabriel said although he grew up in Kwantlen, he didn’t see people in his community making art because of colonial realities. He said when he discovered his culture, he found healing and motivation to create. His art is now showcased around the world. “It wasn’t until I was in my early teens I was exposed to the art of Bill Reid, Susan Point from Musqueam, Robert Davidson who was a Haida artist,” he said. Gabriel said he now considers it a project of his to educate the community around him. “I’ve been doing versions of these talks for years … (and) people come into the room with various understandings of their place and their role in this colonial epicentre that we are now enveloped in,” Gabriel said.